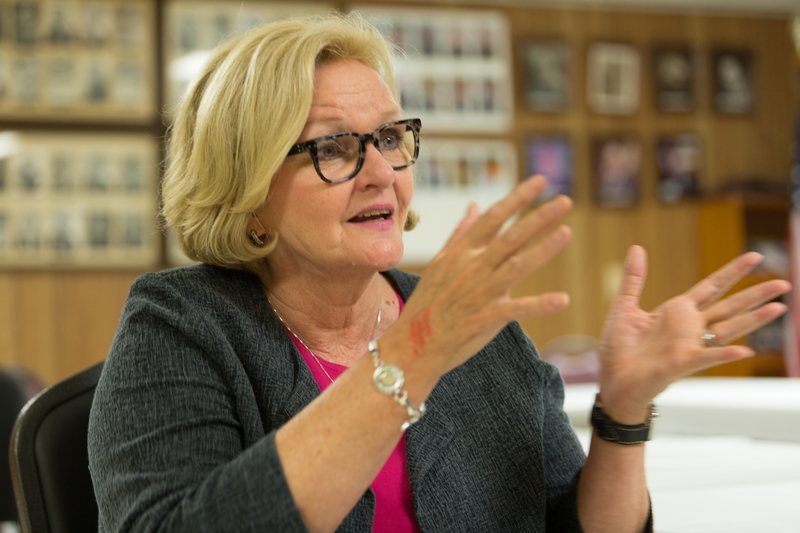 Claire McCaskill, missouri, There's a Democratic Party base? 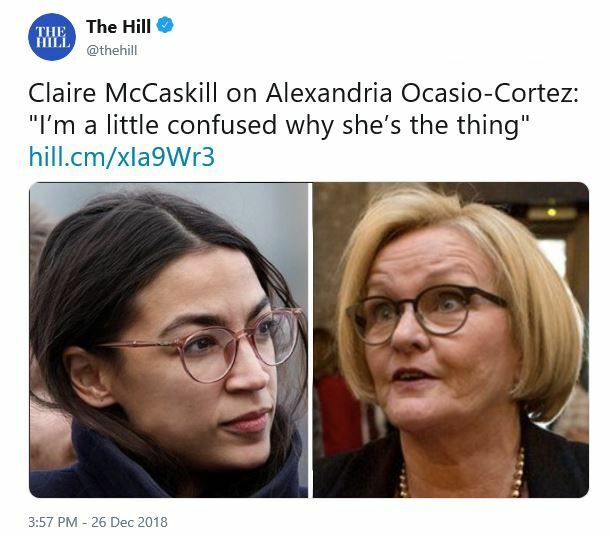 We’re a little confused why Roy Blunt (r) is a thing. Because the republicans party is currently governing with empathy, intelligence, and moral courage? On letting the world know that republican senators think Donald Trump (r) is nuts. She should name them. 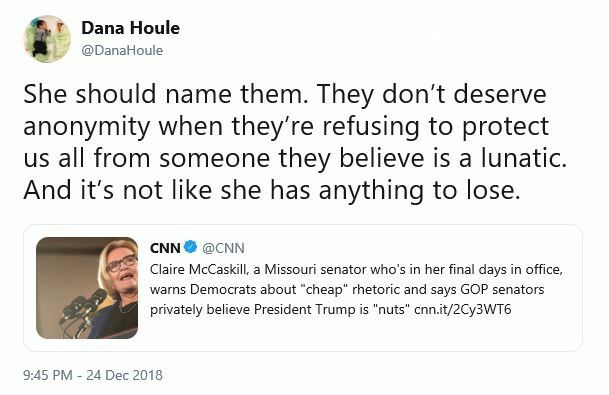 They don’t deserve anonymity when they’re refusing to protect us all from someone they believe is a lunatic. And it’s not like she has anything to lose. It’ll be interesting if any of them bother to deny it. Anyone remember Bill Webster (r)? This isn’t what real prosecutors do. 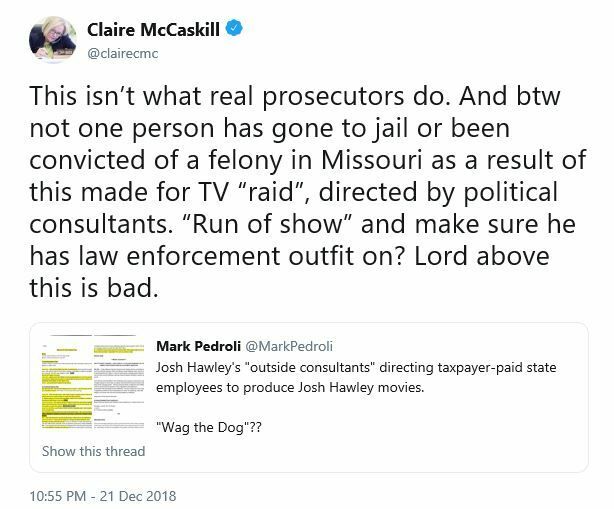 And btw not one person has gone to jail or been convicted of a felony in Missouri as a result of this made for TV “raid”, directed by political consultants. “Run of show” and make sure he has law enforcement outfit on? Lord above this is bad. 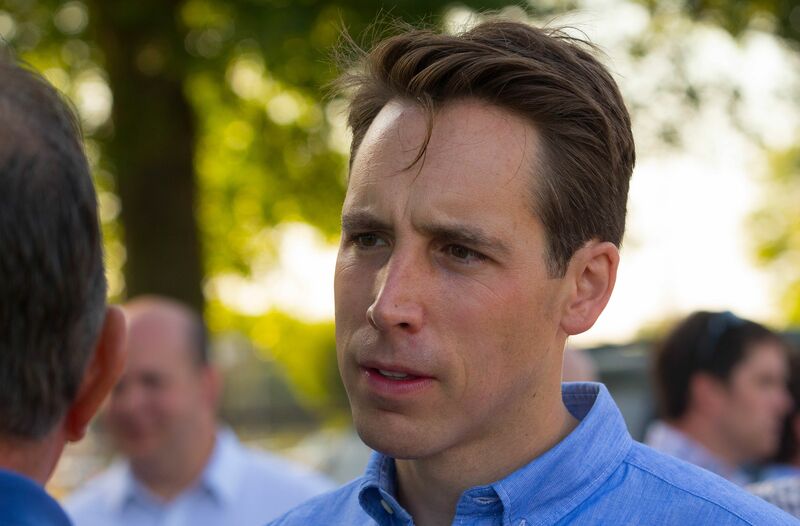 Josh Hawley’s “outside consultants” directing taxpayer-paid state employees to produce Josh Hawley movies. They’re even telling him what to wear. 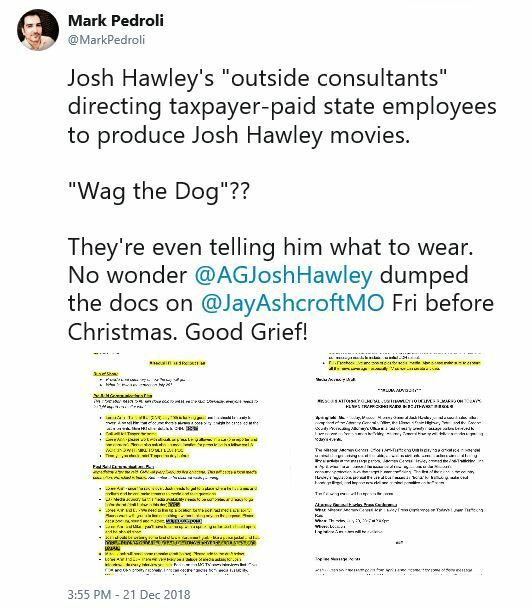 No wonder @AGJoshHawley dumped the docs on @JayAshcroftMO Fri before Christmas. Good Grief! We remember Attorney General Bill Webster (r). “It probably won’t surprise my colleagues to know that I don’t like much the idea of a farewell speech. I haven’t spent a great deal of time contemplating it over the years I’ve been here. I’m not a big fan of the concept. But I want to respect the tradition, especially since I’ve witnessed so many Senate traditions crumble over the last 12 years. So I will do my best to get through this without breaking up. 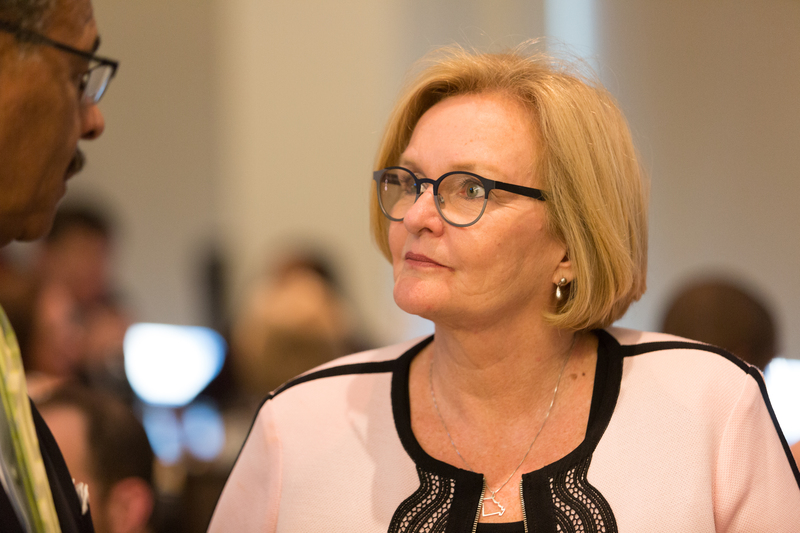 A traditional farewell speech in the United States Senate is full of accomplishments and thanks. I’m gonna skip half of that. I’m extremely proud of my body of work over 34 years of public service, but it is for others to judge, and I won’t dwell on it today other than to say it is a long list and a tangible demonstration of the value of hard work. So Rather than talk about what I’ve done, I want to speak a few moments about my family—and I have three different families I want to talk about today. My actual family. My family I like to call Missouri—or Missourah, we argue about it a lot. And my family here in the Senate. First my actual family. Because they are the most important. I have been very warm my whole life. I have not trembled in the cold, because I’ve always had my family. My parents taught me that caring about the community around us was noble and good, and that holding public office was an honorable endeavor, even though my parents were largely spectators and supporters, and not candidates or office holders. They just cared—and they wanted me to care too. And at the risk of going down too many family stories, it may explain a lot that my dad fell in love with my mom when he saw her smoking a cigar and belting out Won’t you come home Bill Bailey at a party. And that my mother made me say, “Trick or treat, and vote for JFK,” when I was 7. And that my father insisted that I not only learn the rules of football, but that I also learn to tell a good joke and to learn to laugh at myself. My siblings, my two sisters, my brother. They simply have been the port in every storm. My children, we have a large blended family of many of children and grandchildren that is close and loving. I adore them all. But I need to specifically mention my three children: Austin, Maddie, and Lily. Because they were there from the beginning. Infants in car seats going to political events, toddlers sitting sometimes not so quietly as I gave a speech, and then amazing troopers in the almost decade of my career when I was a single working Mom, hauling them all over the state on campaigns. They now have forgiven me for the missed recitals, and the missed field trips, and the fact that I couldn’t be the homeroom mom. Today they have grown into amazing strong adults who make me very proud. And my husband, Joseph. How lucky I am to have him as my best friend. We were married 16 years ago, after I was well in to my political career and after he had achieved great success in business. He is proud and supportive of me always—but he certainly didn’t bargain for the incredibly unfair treatment we got at his expense because of his business success. Let the record of the Senate now say what my Republican colleagues did not during my campaigns. Thank you Joseph for your integrity, your honesty, your generosity, and your heart—which has always directed you to do good as you do well. And then there’s my Missouri family. I love my state. All of it! Every corner of it—even the parts that aren’t very crazy about me. 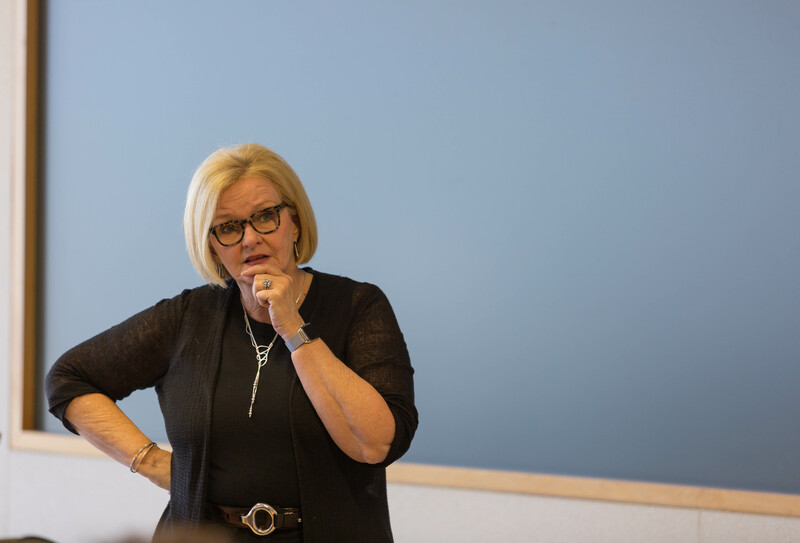 My honor to work for Missourians has been immense, and I’m incredibly grateful to them for the opportunity I’ve had to get up every day and work my heart out in an interesting, challenging career of public service. And so lucky to have made many, many good friends along the way. I’m excited that I will now have more time for them. David Stier said, “Family means no one gets left behind or forgotten.” And that’s how I feel about Missouri. 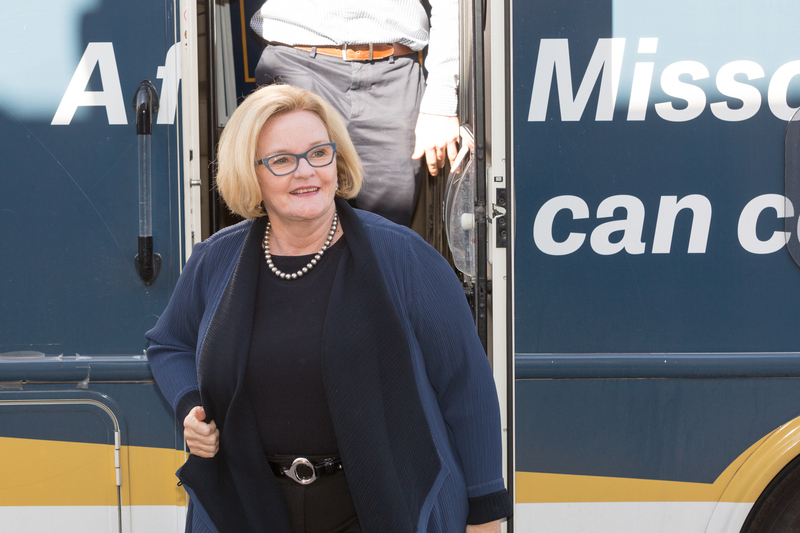 That’s why my office has tried very hard to help every individual who has come to us for help—every veteran who has needed assistance, every senior caught in Social Security red tape. No matter who they were, or where they lived, or what their politics were. And my staff family. Mr. President I ask unanimous consent that my staff’s names be entered into the record. 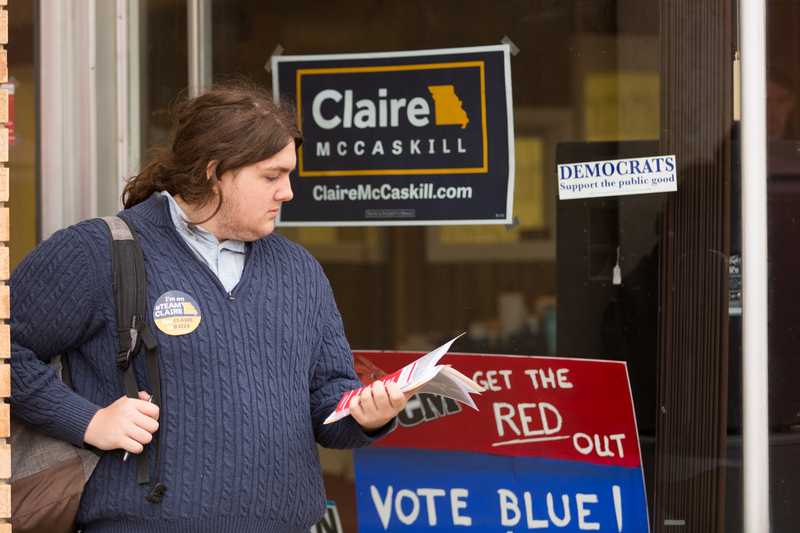 My staff, here and in Missouri, in this job, my previous jobs, and many, many campaigns. Richard Bach said it best, “The bond that links your true family is not one of blood, but of respect and joy in each other’s life.” They have been my rock, my compass, my inspiration, and my coach. The best and the brightest, looking not for money or fame, but just to make a difference. We were happy, and it made a difference. George Bernard Shaw said, “A happy family is but an earlier heaven.” Working with my staff was heaven. And finally, to all of my fellow Senators, and all the many people who work here in the Senate. I’d be lying if I didn’t say I was worried about this place. It just doesn’t work as well as it used to. The Senate has been so enjoyable for me, but I must admit it puts the fun in dysfunction. Peter Morgan, an author, said, “No family is complete without an embarrassing uncle.” We have too many embarrassing uncles in the United States Senate. Lots of embarrassing stuff. The United States Senate is no longer the world’s greatest deliberative body. And everyone needs to quit saying it until we recover from this period of polarization and the fear of the political consequences of tough votes. Writing legislation behind closed doors, giant omnibus bills that most don’t know what’s in them, K Street lobbyists knowing about the tax bill managers package before even Senators. That’s today’s Senate. And no amendments. Solving the toughest problems will not happen without tough votes. We can talk about the toughest problems. We can visit about them, we can argue about them, we can campaign on them. But we’re not going to solve them without tough votes. It will not happen. My first year in the Senate was 2007. We voted on 306 amendments in 2007. This year, as of yesterday, we voted on 36. That’s a remarkable difference. Something is broken, and if we don’t have the strength to look in the mirror and fix it, the American people are gonna grow more and more cynical—and they might do something crazy like elect a reality TV star President. I’m not kidding. That’s one of the reasons this has happened. 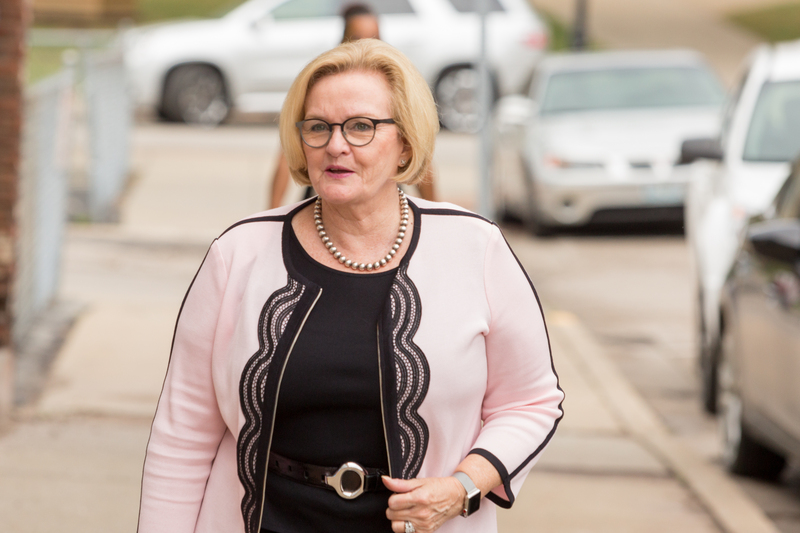 Power has been dangerously centralized in the Senate. We like to say, “Oh, we can’t change the rules, we’ll be just like the House.” We kind of are like the House, guys. We kind of are. A few people are writing the legislation, a few people are making the decisions. We have to throw off the shackles of careful, open the doors of debate, reclaim the power of members and committees—and most of all realize that looking the other way and hoping that everything will work out later is a foolish idea. And for gosh sakes, debate and vote on amendments. But with all the problems I’ve outlined, know that I love this place and you. Almost all of you! You have filled my life with interesting work and unforgettable memories. We have argued, we have sang, we have fought, we have cried, and we have laughed. Together. Just like family. You are family, and I will miss you terribly. 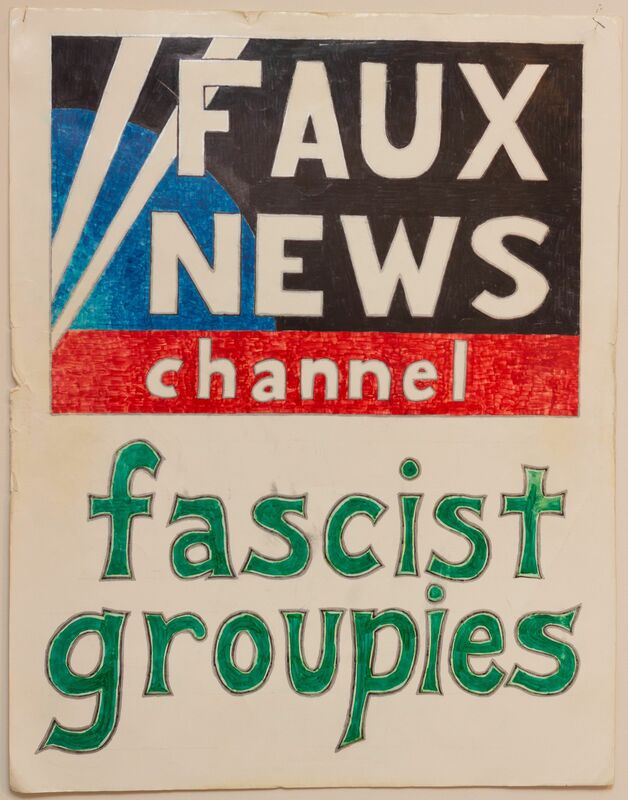 “Faux News channel, fascist groupies” – protest sign, circa 2003- 2004. I have been interviewed on tv a gajillion times. I have never been given the questions, much less allowed to approve their scripts! This is bizarre. Fox and Friends is a wholly owned subsidiary of the Trump administration. 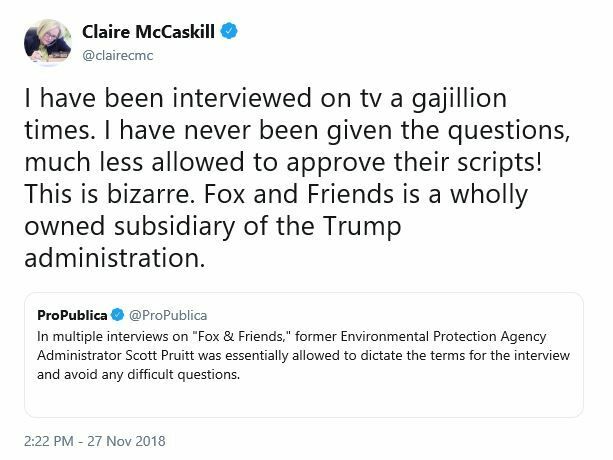 In multiple interviews on “Fox & Friends,” former Environmental Protection Agency Administrator Scott Pruitt was essentially allowed to dictate the terms for the interview and avoid any difficult questions. We knew a long, long time ago. Saving on rent and airfare, what’s not to like? 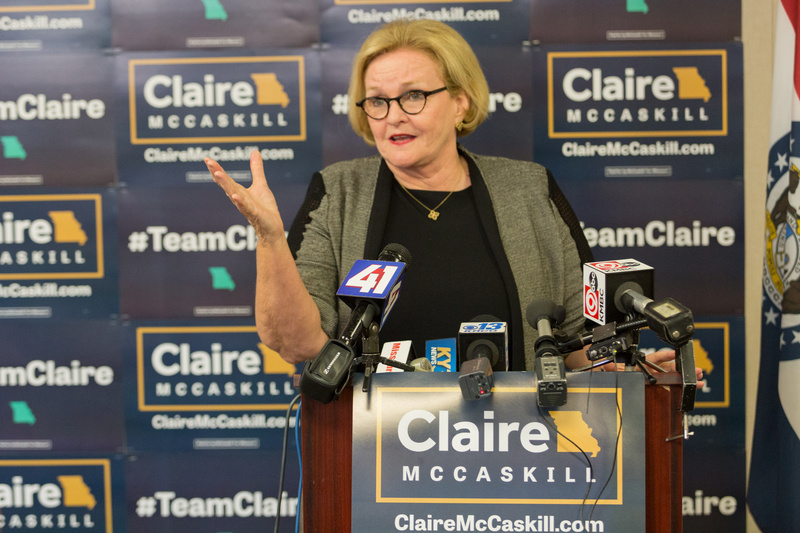 Claire McCaskill (D) has conceded. There’s not much else to say, is there? Turnout is high. Beyond predictions.